OK, if I were a fancy person, I'd know the correct name for the thing, but I'm not, so I don't. But it does make my cake look quite nice. And if you re-arrange the way the glass goes together, you have a punch bowl. It's very pretty. A sister from our ward was moving to California, and giving away what didn't fit in her car. I went over and helped her organize and clean and take boxes to the post office last week, so I got quite a bit of the stuff. This nice cake thingy was one of the many things. 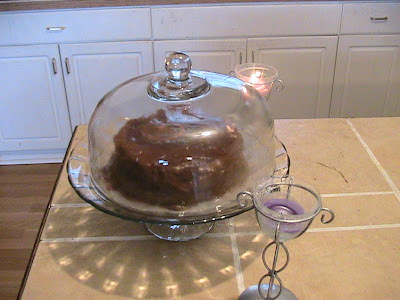 I call mine a cake plate..I have too, one like that...then one without a lid. Cake Plate! Thats sounds so much nicer than "cake thingy". Good job you guys! Hope your kids don't get their hands on that, they'll manage to make 100 pieces of glass out of 2 pieces, lol. Nice Cake Plate, now may I have some please!